Conquest offers parents, schools, and parishes with methods, material, and training to help boys grow in their faith and serve others. Our method combines different elements that together make our program unique and effective: team based and teen led; service driven, virtue centered; age specific; flexible and ready to use; relevant and fun; 100% Catholic and gender specific. 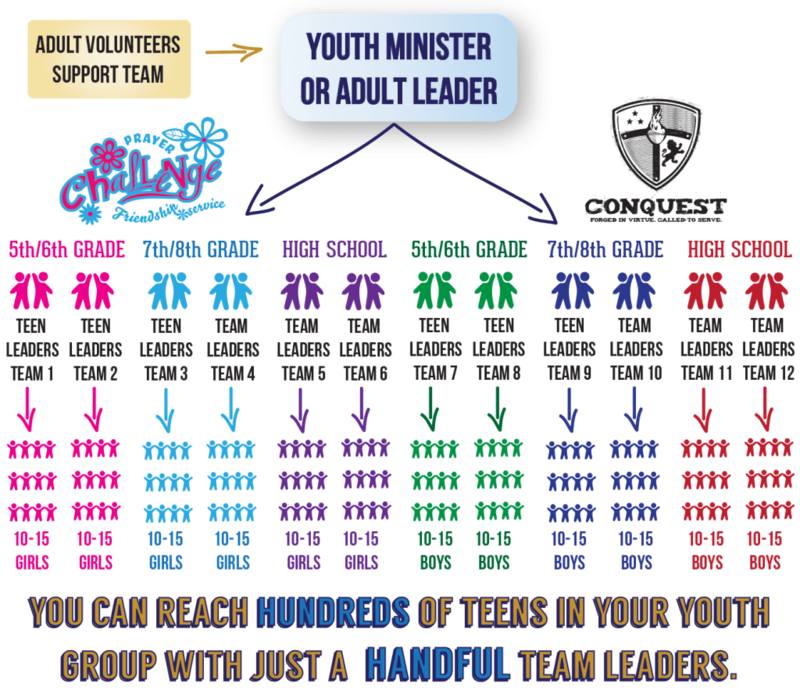 Conquest is designed so that you organize your youth group into smaller teams of about 10-15 teens, who are around the same age. 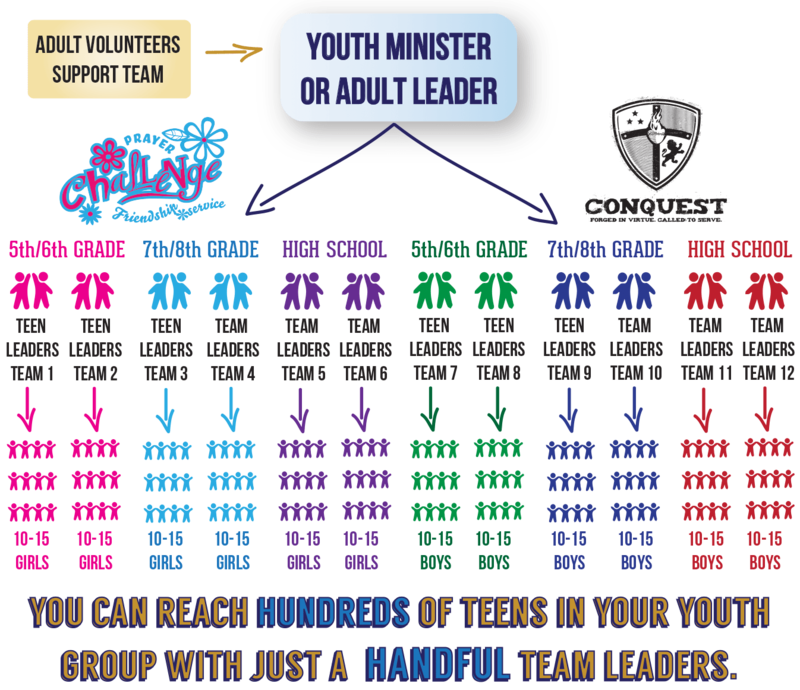 Each team is led by 1 or 2 teen leaders who are usually 2 or 3 years older than the group they lead. This is small group mentoring or peer ministry where everything is done in teams especially the weekly activities and service projects. The youth minister and adult leaders work with the teen leaders, training them and helping them prepare to lead their team activities each week. In this way, the youth group may be large in number but no one will feel lost in the crowd because they are part of a team with a team leader looking out for them. Peer mentoring is not only a life changing experience for the teen leaders, it truly makes an impact on the younger teens when they learn about their faith and see positive role models in their team leaders, who are only a few years older than they are. 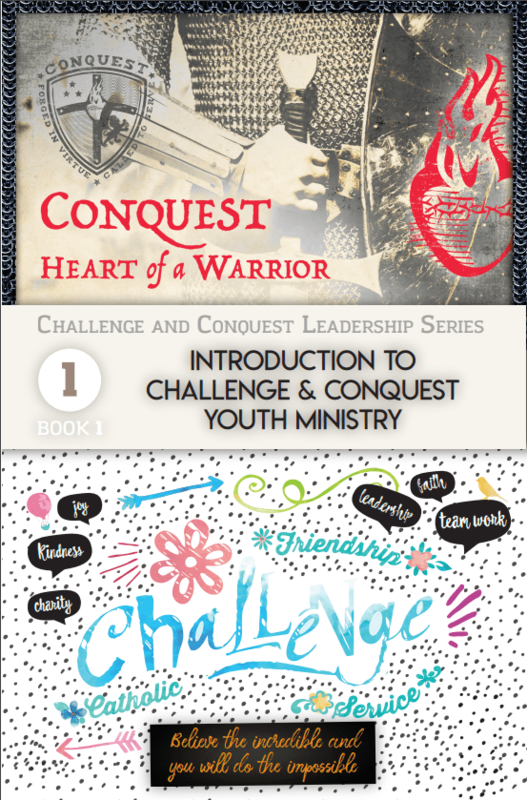 The Conquest curriculum is in the team leader guidebooks, and is written for teens to lead. We put the tools and materials in the team leader’s hands to mentor each week. In every guidebook there are age and gender specific service projects that have been successful in Conquest groups over the past 10 years. Over the course of the year, each team can do 4 to 5 projects. There are also over 30 other project options they can choose from on the online resource center if they want to do something different. How can service projects transform my youth group? which has proven itself to work for the past 10+ years. Each team leader guidebook has an apostolic service project but there are other projects that can be found on the online resource center that the teams can choose to do instead. It’s a structured but flexible program. The team leader guidebooks have everything the team leaders need to lead the weekly activities. Our curriculum is in the team leader guidebooks. There are 3 different series years for Conquest: Series 1, 2 and 3 for 5th/6th, 7th/8th, and high school. The weekly team activity is where it all comes together in Conquest.